Steel Magnolias closes to rave reviews! As the director of this play, I couldn’t be more proud of what we have achieved with this play. The outcome exceeded my expectations ten fold. Ticket sales were strong. Audience response was amazing. My cast were so emotionally invested that it made for some outstanding performances on the nights. My backstage and tech crew gave it their all. Pretty much everyone knew how special this was going to be and supported whole heartedly. “Director Melanie Wilcox did a top notch job of drilling her cast. I take my hat off to her for both taking on a major role and directing, not an easy task at the best of times! However, what she created was a top-quality team of actors playing off each other with real understanding”. So that’s it! The show is over. And to quote M’Lynn, “Life goes on”! The Steel Mags have left the building. 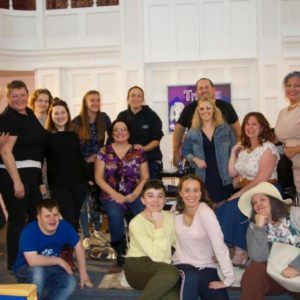 BATS commenced the audition and rehearsal process for their Panto “Robin Hood” last night which will be on in February 19. we are always on the look out for fresh talent, so if you fancy joining our crew, on stage or off stage, checkout the contact us page on this website for details on how to join.